On the morning of Tuesday July 30, Mercury will be at its furthest from the sun, just under Jupiter and Mars. Most stargazers have never seen the planet Mercury because it never strays very far from the sun. 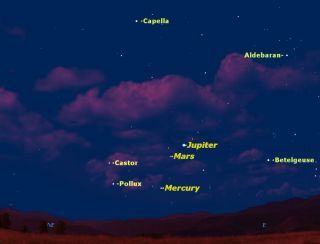 This week is one of the rare opportunities to catch the tiny planet just before sunrise —and with two other planets nearby. Two things about Mercury make it a tough sky target. First and foremost, it never strays far from the sun because of its location in the inner solar system. It is always observed against a bright twilight sky, either half an hour after sunset or half an hour before sunrise, and always low in the sky. The challenge in observing Mercury is to find a tiny speck of light, low in the sky, against bright twilight. This week offers one of the rare opportunities when conditions are at their best. Mercury will be farthest from the sun in our sky on July 30. The weeks just before and after this date are equally favorable. The best time to spot Mercury will be about 40 minutes before sunrise, a balance between Mercury's altitude above the horizon and the brightness of twilight. Scanning the sky with binoculars will help to spot the tiny speck of light. Once spotted in binoculars, you should just be able to see Mercury with the unaided eye. Because of Mercury's low altitude, a low cloudless eastern horizon is necessary. The task is made easier by the presence of two much brighter planets in the dawn sky, Jupiter and Mars. Mercury will be below and to the left of these two objects. Once you spot Mercury, locate it relative to landmarks on your horizon, and see how high you can follow it as it rises and the sky becomes brighter. If you have a telescope, this task becomes easier. Seen in a telescope, Mercury will look like a tiny gibbous moon. As it rises higher in the sky, it will clear the turbulence, and the view will improve. Congratulations! You have succeeded in observing one of the most elusive objects in the sky. It is said that the great 16th-century astronomer Johannes Kepler never managed to see Mercury.